Something that I have always been only very marginally skilled at is graphics. Specifically I’m talking about creating completely new graphics on the empty canvas of a program like paint or GIMP. As a matter of fact, except for doing occasional touch ups and slight modifications of existing pictures, I’m downright terrible at it. That’s more of a problem than you might think. You see, among the many ideas that I have for videos are several that require “virtual sets” which are basically pictures of the environment you want to use for the video so that you can, with chroma key, put your actors into it virtually in the video editor after shooting them acting against a green screen. Several of these ideas require that I have sets with some really cool looking modern furniture, control panels, starship systems and so on. I am NOT anywhere nearly good enough with graphics to create something like this from scratch and there’s no way I can afford to have a graphic designer make it for me. This means that I either put the idea aside until I can afford one or just forget about it entirely. Usually I end up having to forget about it completely because by the time I will have the resources to get the virtual set made that I need, the idea will no longer be relevant. This is one of the things I hate about having to make videos on a shoestring budget. So many good ideas get flushed down the toilet because I just don’t have the resources to make them. How’s This For A Dr Phil Moment? Comments Off on How’s This For A Dr Phil Moment? Y’know, it’s amazing how many of these things there are. This one is priceless in it’s use of the Dr. Phil-ism. 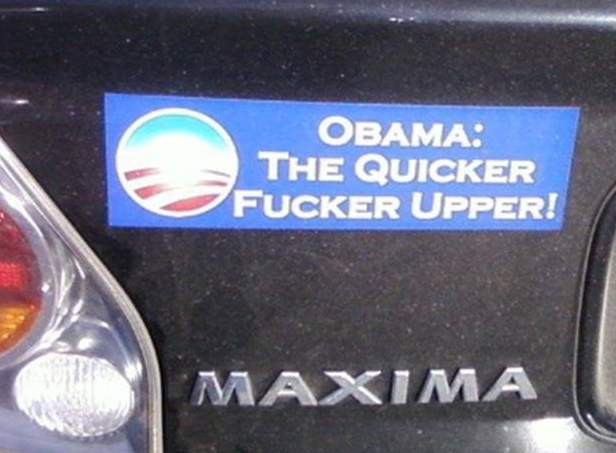 I just went over to have a look at what Amazon.com has and ran into yet another gem of an anti-obama bumper sticker. The sad part is that it’s sold out. Why am I not surprised? Comments Off on Found Another one! I wish that I’d waited a few minutes before publishing that last post. No more than two minutes after I hit “publish”, I found this gem. Since Obama first appeared spreading his slick talk and conning people out of mountains of money in the form of contributions to his campaign I have been trying to come up with the perfect snappy description of him. Somebody in Maine beat me to it with a bumper sticker that Exactly describes him!